A photograph of a multi-course temple food set, Hee, available at the Balwoo Gongyang restaurant in downtown Seoul. 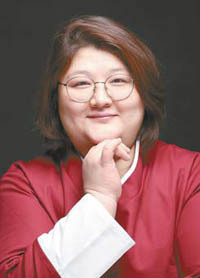 Chef Kim Ji-young of Balwoo Gongyang, who learned temple food from Ven. Sunjae. Although temple food is respected and loved within Korea, its broader popularity is another question. But after Balwoo Gongyang received one Michelin star in the first Michelin Seoul Guide released last year, it is safe to say temple food may be on its way to becoming the next big thing. The restaurant, located across the street from Jogye Temple in downtown Seoul, has been fully booked since the Michelin Guide's first Seoul edition was published last November, making short-notice reservations next to impossible. "There was a sharp increase in reservations the month after the Michelin Guide Seoul was published, but reservations are back to normal, maybe slightly higher," said Eugene Kim, chief manager of the temple food restaurant. The restaurant is operated by the largest Buddhist sect in the country, the Jogye Order's Cultural Corps of Korean Buddhism. This means the restaurant is less concerned with financial returns than with retaining the essence of temple food. 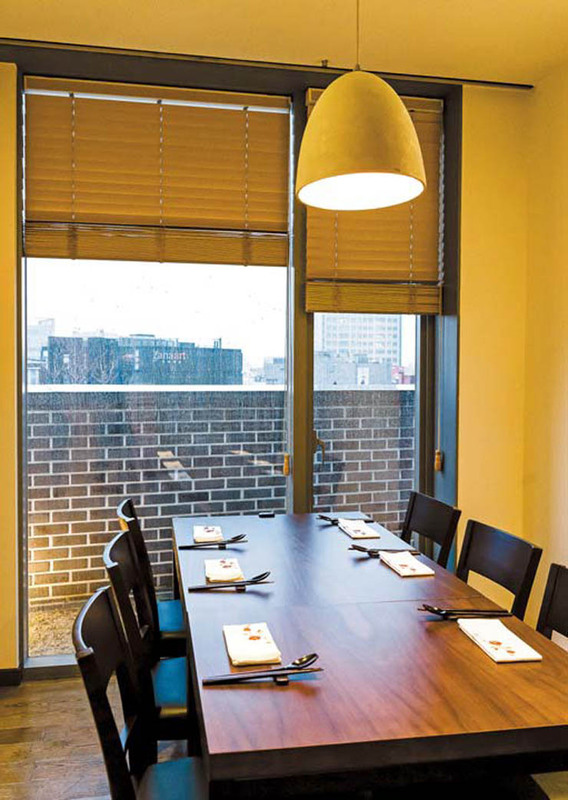 The restaurant has 11 private rooms for groups. All in all, the restaurant has a capacity of 58 customers. The restaurant offers four multi-course meals — the Seon, the Won, the Maeum and the Hee — which changes according to the four seasons. The Seon, priced at 30,000 won and available at lunch, features 20 dishes. The Won, priced at 45,000 won, features 21 dishes. And the Maeum, priced at 65,000 won, features 22 dishes. The Hee course, for 95,000 won, is available only through reservation and must be paid in advance; cancellations and refunds are not available for this meal. All these multi-course meals start with porridge, move onto starters, then the main meal of rice wrapped in a lotus leaf with soybean paste soup, and dessert. Meanwhile, the cold noodle dish — one of the most popular dishes at the restaurant and a favorite of the current leader of the Jogye Order, Ven. Jaseung—is also included in the Won, Maeum and Hee options. As a course set menu, the Won starts with millet porridge and vegetables with cilantro, deep-fried mushrooms in chili pepper paste among appetizers. Following the starters is the signature cold noodle dish whose sauce is made by sauteeing shiitake mushrooms in perilla seed oil, ground chili pepper and soy sauce and then adding pureed Korean pears, mustard and vinegar. Then the course ensues with sticky rice wrapped in a lotus leaf with soybean paste soup and concludes with desserts of rice cakes and tea. It seems like a lot of food, but is not heavy on the stomach. The restaurant uses local organic ingredients as much as it can; for instance, it uses shiitake mushrooms from Geoje Island for the cold noodles, as well as tofu from Tongdo Temple in Yangsan, South Gyeongsang Province, and buckwheat noodles from Bongpyeong, Gangwon Province, in various dishes. Chef Kim Ji-young works with the other chefs in preparing the temple food. Kim, 44, studied for a long time under Ven. Sunjae, a designated temple food master and culinary teacher. "I think one of the restaurant's appeals is that people who come here can taste food that is made the same way as in the old days," Kim said. "We had this 20-something American visitor from Tennessee who told us our food tasted like the food cooked by his grandmother," she recalled. She said she is happy about the Michelin star as it may contribute to popularizing temple food. Eugene Kim, chief manager of the temple food restaurant, agreed that the Michelin recognition will enhance attention and understanding on temple food but that there are some concerns that the Michelin recognition may shift focus to gastronomy rather than the essence of temple food. Temple food focuses on eating at the right time, eating seasonal food, eating proportionately and avoiding meat. Ven. Sunjae, chef Kim's teacher, has said that temple food is to purify the body through eating healthy natural ingredients so the eater may also purify the mind and gain wisdom and compassion and its principle applies to both the practitioner and the lay person alike. The name of the restaurant, Balwoo Gongyang, refers to an alms bowl meal or the practice of eating Buddhist meals. The word "balwoo" is a bowl with a moderate amount of rice and vegetables, and "gongyang" refers to eating. After opening in 2009, the restaurant went through a renewal in 2016. In the same year, the restaurant received two awards in addition to the Michelin star — a Muslim-friendly restaurant recognition by the Korea Tourism Organization in August and the Good Design Award at the Chicago Design Awards in December. Temple food in Korea does not use meat or any of the five ingredients commonly used in Korean dishes: garlic, green onions, leeks, wild chives and Chinese squill. Thus, some diners may find the cuisine at Balwoo Gongyang milder-flavored than other Korean dishes, which are often hot and spicy. "We use traditional pastes, including soybean paste and red chili pepper paste, as well as soybean sauce, rice honey and vinegar, along with seasonal ingredients," Kim said. When told that her shiitake cold noodles tasted fantastic, she attributed the taste to winter Korean pears. Asked why the cold noodle dish is not available a la carte but rather as part of multi-course meals, both the chef and the chief manager said the rooms-only structure of the restaurant and how the chief chef Kim is able to produce the standardized fantastic taste remain challenges. Chef Kim prepares the dishes based largely on Ven. Sunjae's recipes; she follows the ingredients and steps in the recipes but usually determines the cooking time or method herself. "I too used to follow the standardized recipes when I cooked, but now I watch the ingredients cook to see how much more time is needed for them to, say, stew or fry. It is actually paying attention to the ingredients, being one with the ingredients and the food I am making," Kim said. The most important lesson she learned from her teacher, Ven. Sunjae, is that food is about the care and energy given to the ingredients, which is retained and delivered to the eater. "It is like the ingredients and I are not two but one," Kim said.